However, Israel's military said it had shot at and captured a Palestinian man who tried to breach the Israel-Gaza border fence while hurling grenades. Palestinian health officials later said a fisherman had been killed by Israeli fire in northern Gaza. The Israeli military said soldiers had shot the man because he was advancing towards the border fence. The fighting - the most intense since the 50-day war in 2014 - began after an Israeli special forces undercover operation in Gaza was exposed on Sunday, triggering clashes that left seven Palestinian militants and one Israeli soldier dead. Late on Monday, militants launched a barrage of rockets and mortars at Israel. One of the rockets hit a block of flats in the town of Ashkelon, killing a Palestinian man who was working in Israel. In response, the Israel Defense Forces (IDF) carried out what it called a wide-scale attack against targets belonging to the militant groups Hamas, which dominates Gaza, and Islamic Jihad. The Hamas-run Gaza health ministry said seven people were killed in the strikes. Five of the dead were said to be militants and the other two farmers. Hamas and other Palestinian factions announced on Tuesday afternoon that they had accepted an Egyptian-mediated ceasefire and would abide by it if Israel did. 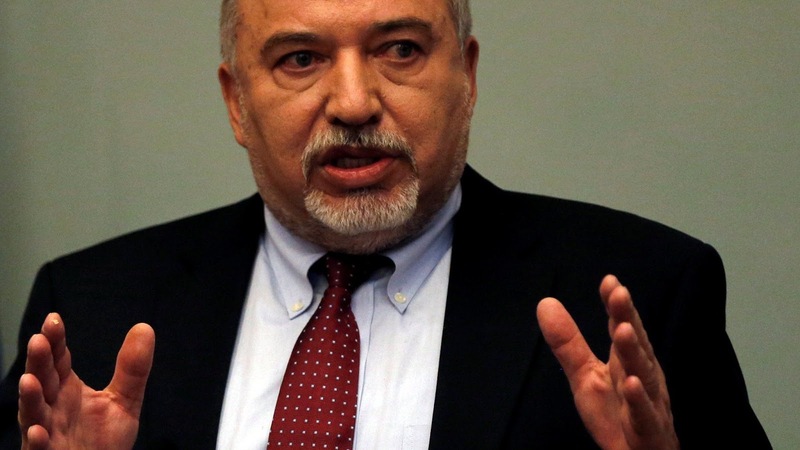 Israel's security cabinet initially said only that it was ordering the military to continue its operations as required, but Mr Lieberman and another minister appeared to confirm it had agreed to accept a ceasefire when they denied supporting it. At a news conference in Jerusalem on Wednesday, the defence minister said the military response to the rocket fire had been "insufficient and inappropriate". He added that the government was making a serious mistake by accepting a ceasefire with Hamas and other militant groups that Israel, the US, EU and UK have designated as terrorist organisations. "We are buying quiet for the short term at the price of serious damage to national security in the long term" he warned. Mr Lieberman revealed he had similarly opposed recent decisions to allow into Gaza fuel for the territory's power plant and $15m (£12m) in cash from Qatar intended to fund the salaries of unpaid civil servants in the Hamas-run government. "I could not remain [in office] and still be able to look residents of the south in the eyes," he added. Dozens of residents of Israeli border communities protested after the ceasefire announcement at what they called the "lack of action by the Israeli government" to deal with the threat of Palestinian rocket attacks. He has been calling for tough Israeli military action against Hamas and has opposed ongoing efforts by Egypt and the UN to secure a long-term ceasefire deal that would quieten the Israel-Gaza border. His hawkish stance as defence minister has often left him at odds with the military top brass. But it plays out well with the voter base of his political party. The decision to withdraw Yisrael Beiteinu from the coalition government weakens Prime Minister Benjamin Netanyahu, who now controls just 61 of 120 parliamentary seats. However, an official close to Mr Netanyahu told the BBC it was "not necessary to go to elections in this sensitive security period". He added that the prime minister would now take over the defence ministry. Mr Netanyahu's office said he was holding consultations with ministers from his right-wing Likud party and other party leaders in effort to stabilise his coalition. Earlier, the prime minister defended the ceasefire decision, saying that "in times of emergency, when making decisions crucial to security, the public can't always be privy to the considerations that must be hidden from the enemy". "Our enemies begged for a ceasefire and they knew very well why," he added. Opposition leader Tzipi Livni of the centre-left Zionist Union alliance demanded an early general election. "The government of failure in security must go," she said. "No peace, no security - elections now that will lead to an emergency coalition headed by the Zionist Union. We will restore security and act for peace." Hamas spokesman Sami Abu Zuhri said Mr Lieberman's resignation was "recognition of the defeat before the growing force of Palestinian resistance".